Officially launching the new Europeana 1914-1918 thematic collection, Europeana Transcribathon Campus Berlin 2017 marks the next milestone for the crowdsourcing digital archive dedicated to the historical conflict, and puts a spotlight on the involvement of its community. 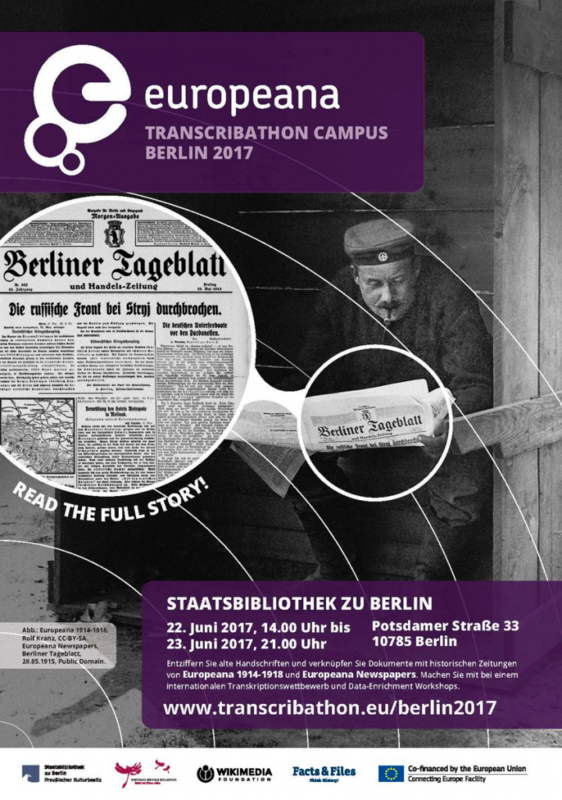 On 22 and 23 June, the Berlin State Library will host the Europeana Transcribathon Campus Berlin 2017. Over two days, teams from three generations and several European countries will compete to digitally transcribe as many World War One documents as possible, and link them to other historical sources such as early 20th century newspapers. Transcribathons gather people from across Europe and online to create digital versions of handwritten items found on Europeana 1914-1918. These innovative events are the latest crowdsourcing initiative enriching the Europeana 1914-1918 digital archive. Since their launch in November 2016, more than several million characters and 12,000 documents, from love letters to poems, have been transcribed. These unique resources found on Europeana 1914-1918 have been collected and digitized since 2011 during collection days and online uploads inviting people to submit their personal documents. During Europeana Transcribathon Campus Berlin 2017, Europeana 1914-1918, previously living on a separate website, will officially move platform and re-launch as a new Europeana thematic collection. This move onto the Collections site aims to broaden the current audience by opening up World War One related content to all Europeana visitors and to enrich their experience. People can now discover digital versions of testimonies handwritten 100 years ago, complemented by millions of digitized newspapers and documents provided by libraries and archives. Linking user generated content with other historical sources makes it possible to view them within the bigger picture. And thanks to the ability to search across the Europeana platform, people can now also easily access related items from the other four thematic collections: Europeana Art, Music, Fashion and Photography. Europeana Transcribathon Campus Berlin 2017 is organized by Europeana, Facts & Files and the Berlin State Library, in cooperation with the German Digital Library and Wikimedia. Europeana is Europe's digital platform for cultural heritage, collecting and providing online access to tens of millions of digitized items from over 3,500 libraries, archives, audiovisual collections and museums across Europe, ranging from music, books, photos and paintings to television broadcasts and 3D objects. Europeana encourages and promotes the creative reuse of these vast cultural heritage collections in education, research, tourism and the creative industries. Europeana Collections are the result of a uniquely collaborative model and approach: the web platform is provided by Europeana, the content comes from institutions across Europe, while consortiums provide the theme and editorial expertise to bring the content alive for visitors through blogs and online exhibitions. Europeana 1914-1918 is a thematic collection that started as a joint initiative between the Europeana Foundation, Facts & Files, and many other European partner institutions. It originates from an Oxford University project in 2008. Since 2011, over 200,000 personal records have been collected, digitized and published. These events have now expanded to over 24 countries across Europe, building up an enthusiastic community of about 9,000 people. Europeana Transcribe is a crowdsourcing initiative that allows the public to add their own transcriptions, annotations and geo-tags to sources from Europeana 1914-1918. Developed by Facts & Files and Olaf Baldini, piktoresk, the website is free to use and open to all members of the public. New contributors can now register and submit their own stories within the Europeana Collections site.